Review: Nirvana's 'Live At Reading': The Best Live Rock Record Ever? Nirvana's Bleach (reissued this month) didn't make much of a splash when it was released in 1989. But with hindsight, the album shows a band clearly hurtling toward greatness. A mere two years later, Nirvana headlined England's Reading Festival; by then, the greatness was obvious. The Best Live Rock Record Ever? The first time I saw Nirvana, at the club First Avenue in Minneapolis, I didn't really get it. At first. Then the band played "About a Girl," which sounded like something off Meet The Beatles — bent out of shape by punk-metal noise and a much darker take on gender relations than the young Lennon or McCartney had. Released in 1989, Nirvana's Bleach (reissued this month) didn't make much of a splash at the time. But with hindsight, the album shows a band clearly hurtling toward greatness. A mere two years later, Nirvana headlined England's Reading Festival — and by then, the greatness was obvious. 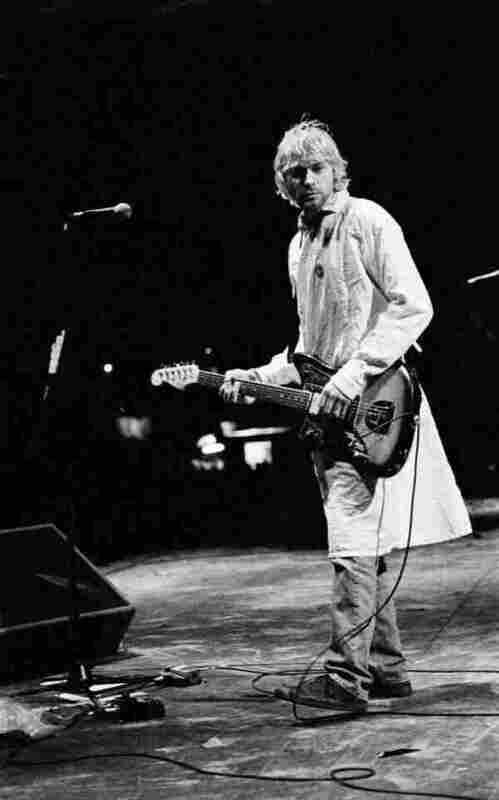 When Cobain took the stage on Aug. 30, 1992, costumed in a hospital gown, his daughter, Frances Bean, had just been born a week prior, and he and his wife, Courtney Love, were in the midst of media firestorm surrounding their heroin use. At points during the Live at Reading DVD, and the slightly edited CD version, the singer sounds like an animal in a bear trap; at other times, you hear pain turned into the pure joy of sonic mayhem. But some of the most telling moments on the DVD are the bits and pieces of cover versions, like the bit of Boston's radio hit "More Than a Feeling" that leads into Nirvana's hilariously similar radio hit "Smells Like Teen Spirit." Or the "Star-Spangled Banner" quote — pulled from a storm of feedback, just like Cobain's Seattle predecessor Jimi Hendrix — that manages to parody a guitar solo while reveling in one. Live at Reading is nothing more than a polished-up version of a bootleg that's been floating around for years. But between the raw power of the music and the details of the DVD — from the small smile on Cobain's face when he gets tens of thousands of fans to yell, "We love you, Courtney," to the close-up of blood spatters on his guitar pickups — I'd argue it's one of the greatest live rock records ever made, if a DVD still counts as a rock record. With the Rock and Roll Hall of Fame celebrating its 25th anniversary, it's a shame Cobain isn't around to throw his two cents at the proceedings. Then again, maybe we should view Live at Reading as just that.